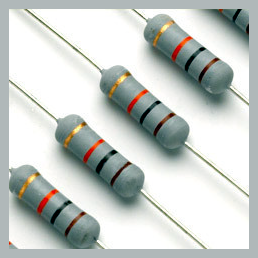 A typical resistor is made up of ceramic material that offers a resistance against the flow of current. On the body of the resistor, typically 4 coloured rings are printed. First and Second rings represent values. 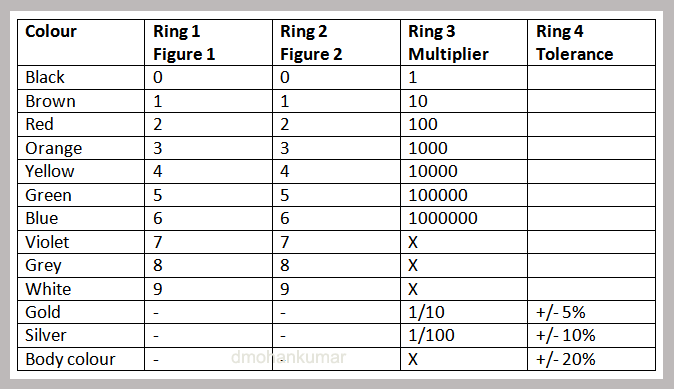 Third ring is the Multiplier for the values and Fourth ring is the Tolerance. Tolerance means the variation in value. For example, a 10K resistor will not typically have 10 Kilo Ohms resistance but it may be 9.9K or 10.1K. This is called tolerance. 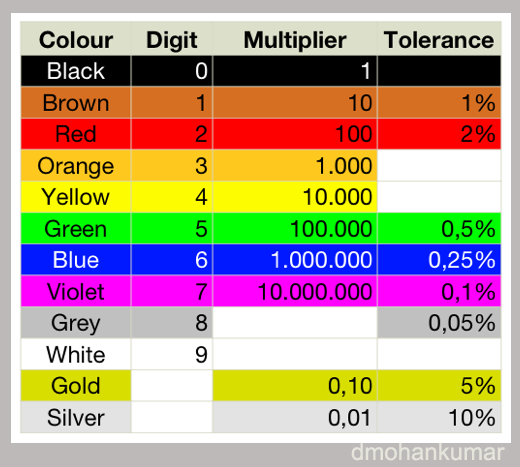 Typically +_ 5% or +_10% tolerance is present in resistors. 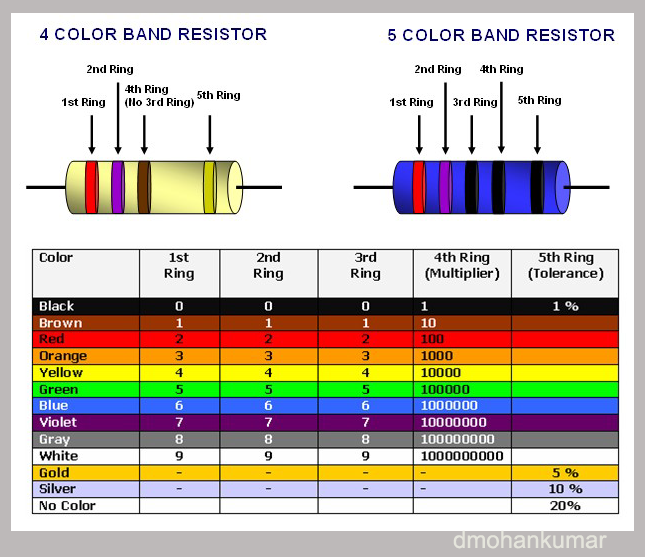 See the colour code of resistors. But there is a Trick for easy identification. A typical resistor has 4 rings. Observe the colour of 3rd ring. From it we can sort the resistor in a range. 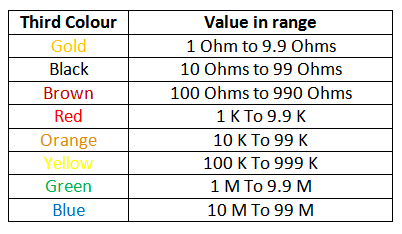 For example, if the 3rd colour is Red, then that resistor falls between 1K to 9.9K. By using this method, you can sort the resistors. Then observe 1st and 2nd bands and calculate the value. Anyway it will be below 10K if the third colour is red. See the chart. Resistors are classified based on the values. Lowest value is Ohm, mid range is Kilo Ohm and highest values Mega Ohm. Symbol of Ohm is Ω. But in circuit diagrams, this symbol is difficult to use, so the letter R or E is used represent Ohm value resistors. Eg. 100 R or 100 E means 100 Ohms. Kilo ohm is represented as K. Eg. 10 Kilo Ohm is 10K. Mega Ohm is represented as M. Eg. 10 Mega Ohm is 10M. We can see different sized resistors, small to large. The smallest one is ¼ Watt and largest one is 20 Watt. Wattage is the capacity of the resistor to handle maximum current. 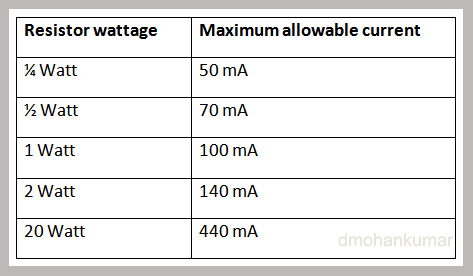 Usually, ¼ watt resistor is used if the current in the circuit is less than 50 milli ampere. If high current is flowing, it is a must to use high watt resistor, otherwise the resistor will burn. See the chart to select resistor based on current. Now, 4 ring and 5 ring resistors are also available. Its identification is slightly different from the standard colour code. 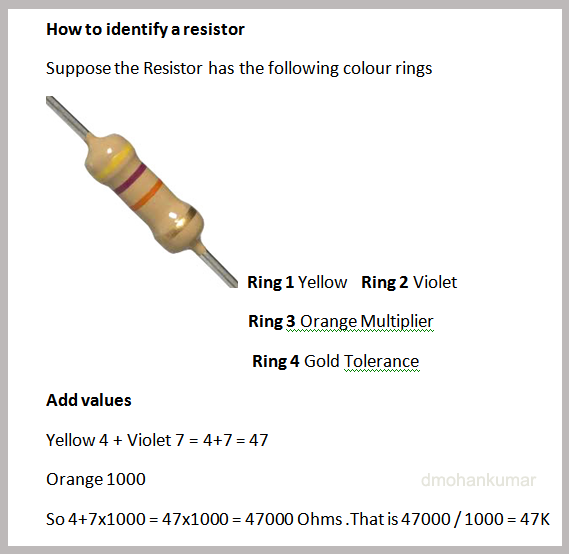 See the colour code for identifying the value of 4 and 5 ring resistors.